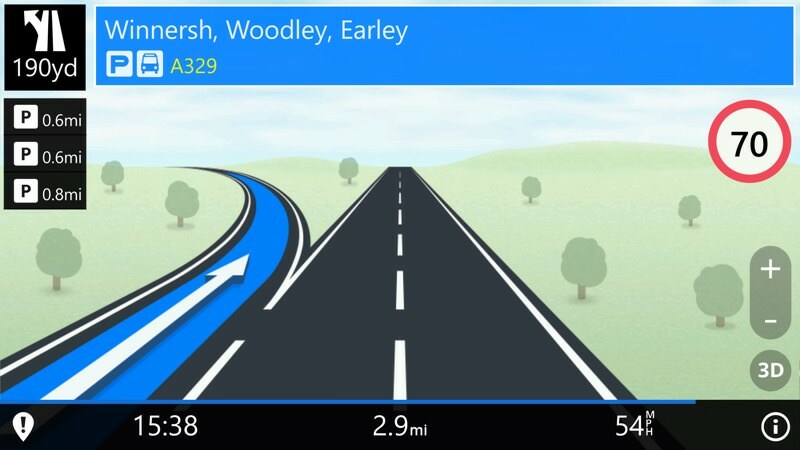 I know, I know, Sygic GPS Navigation is something I'd been meaning to review for years here on AAWP*, but it never quite worked right, despite multiple attempts. 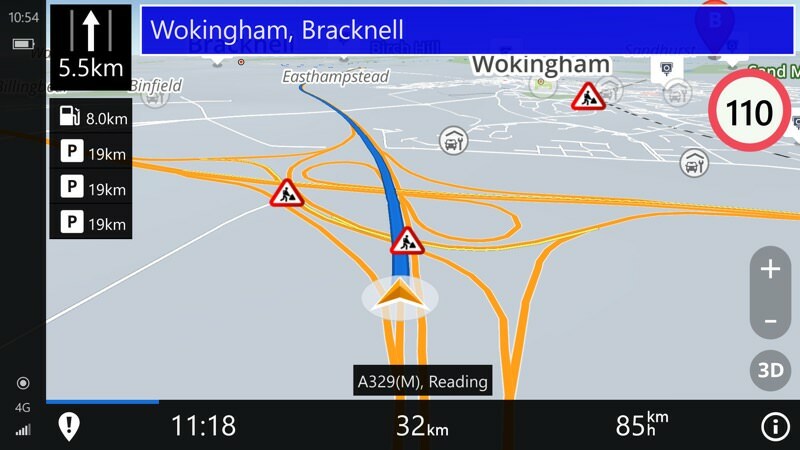 Yet the continued failure of Microsoft to offer real time traffic avoidance in Windows 10 Maps, added to the 'old' maps used (I'm still chasing that one down), led me to experimenting with Sygic all over again. And... it's a story of brickbats and bouquets. The latter because it's a first class navigation solution, the former because it's not 100% stable and because it too has old (2016) maps. One big caveat before I start - a lot depends on the specification of your Windows 10 Mobile phone. Having tried and failed to get Sygic 100% stable on a Lumia 950 (with 3GB RAM), I've now achieved slightly better (>90%) navigation stability under W10M on the Alcatel IDOL 4 Pro (with 4GB RAM), and at some extra cost if this also ticks all your boxes. The goal? To reduce dependence on Windows 10 Maps, but as you'll read below, the experiment wasn't a total success. Notice the 'UWP' part of the name, added by me to indicate that I'm trying the Windows UWP version from the Store. 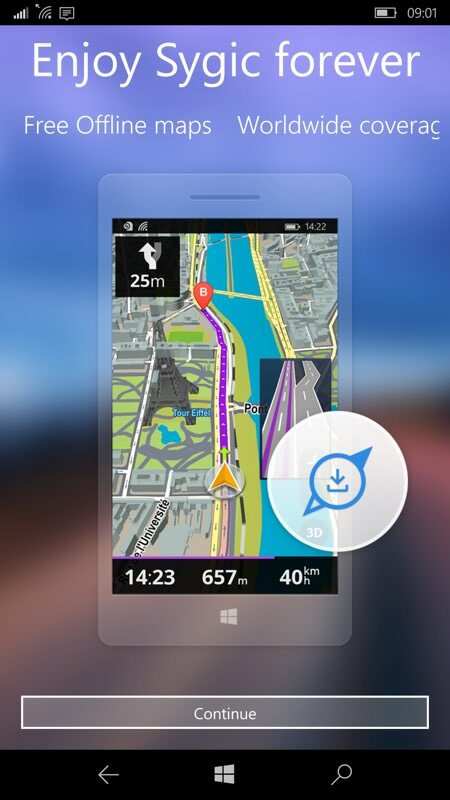 The interface seems indentical to the old Windows Phone 8.1 version and the baseline build of Windows 10 supported is '10069', which was one of the pre-release builds from early 2015, from before Windows 10 was formally released. Leading me to suspect that the old code was ported as quickly as possible and also that nothing has actually been done in terms of improving Sygic's stability in the last couple of years. At least. 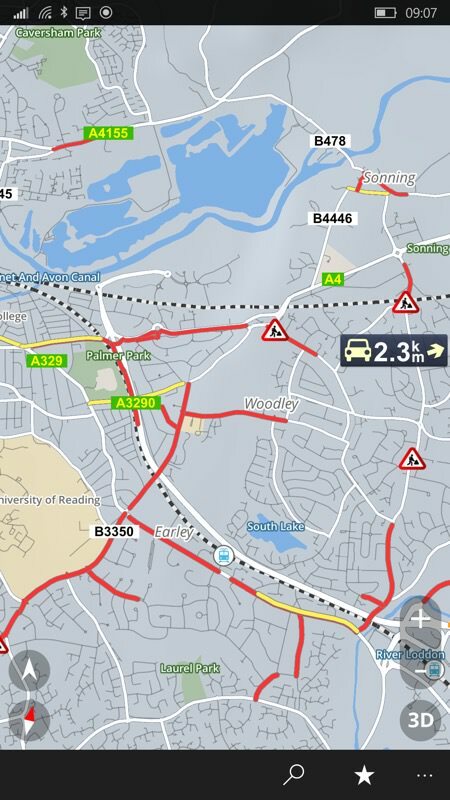 A problem morning on the roads in Reading, caused by roadworks on the main road in. 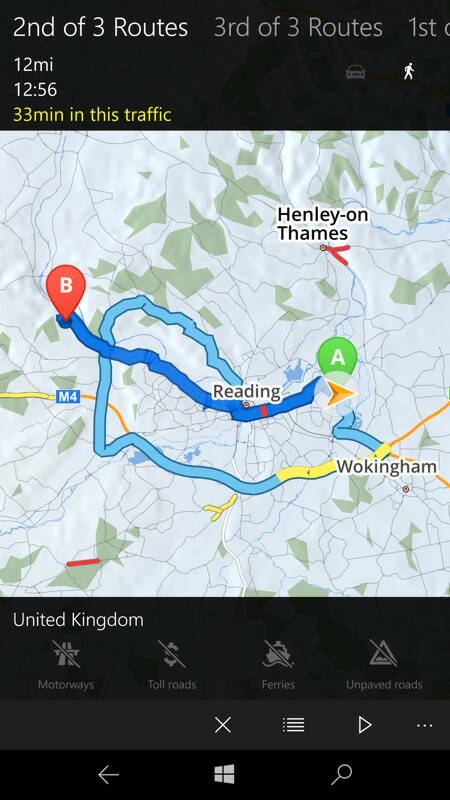 Sygic successfully found a way in using back roads though - hooray! Which is a huge shame, since there's a comprehensive real time navigator here. The interface is busy but very useable, once I got past the hurdle of the opening map view - which has no search control or menu. After a brief puzzled moment, I found that swiping the map away from my current location brought up both the search control and the '...' menu and I was at home from then on. 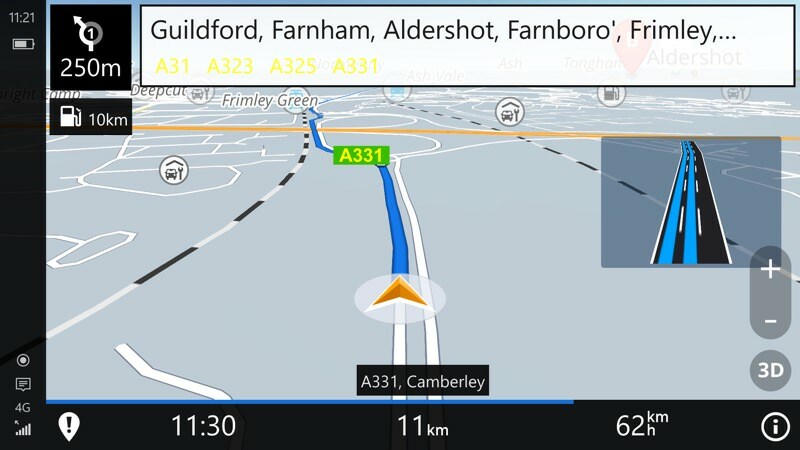 Sygic's navigation UI (best used in landscape, arguably - at least my own dash holder is this way round!) It's all very clear, with ETA, distance and current speed shown along the bottom. Note that metric units are shown here - I switched to imperial halfway through the review period, to experience both! The idea of finding something and then navigating to it is obvious enough, but Sygic goes further with real time traffic avoidance. So, for example, you'll be driving along and it'll say that it's found a better route for you, perhaps avoiding a delay. 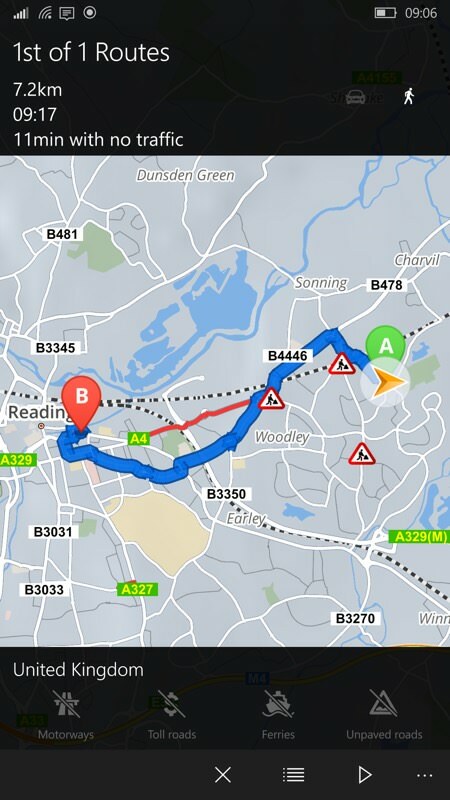 Which is the Holy Grail of sat-nav - as modelled in the Android world by Google Maps. It works well, too, though in an understated way - there's often no indication that the area you're driving into is heavily congested and that the only reason you're not seeing a delay is because Sygic has planned a quick way through. Google Maps would be showing loads of red and orange on the map (for slow traffic), overlaying your best route, but Sygic only ever shows you the latter, so you just have to lean back and trust it. One of Sygic's UI innovations is a 'virtual camera' lane guidance system that appears when you need to make a major lane decision - very nicely done (and animated) indeed. In use, and provided it didn't crash (of which more in a moment), Sygic proved very reliable, getting me to seven urban destinations over the course of the last two weeks. Slightly oddly, it's not very good at recognising when I'd arrived, so in every case I had to 'cancel the route' even while parked at my destination. Speed limit awareness is good (as it is on Windows 10 Maps, in fairness) and your speed panel turns red if you're over the limit. 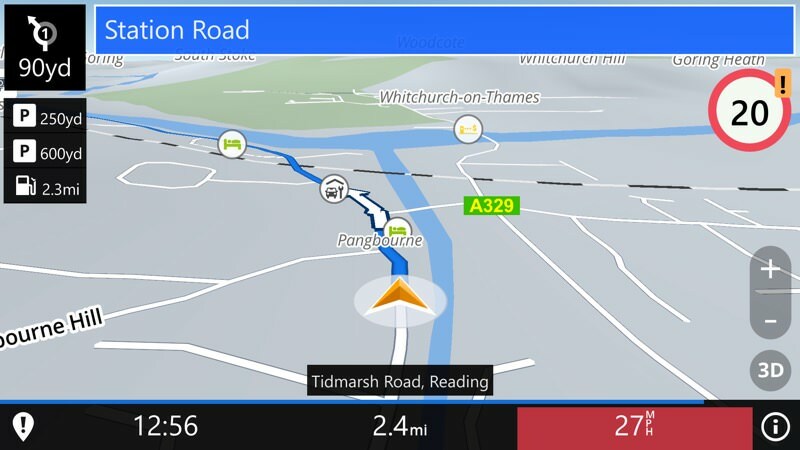 While driving, petrol stations are shown down the left side of the UI, and it's a doddle to tap one and have it instantly added as an extra waypoint, though if you then change your mind and sail past that point, there's no intelligence here to realise that you're carrying on and so then Sygic keeps trying to route you back to that petrol station. Even when you're 20 miles further down the road. In practice, I had to pull over, cancel my route, and then plan to my destination again, which isn't ideal. Further to the lane guidance shown above, you get this much bigger version when you're on a motorway and need to turn off - making the point more clearly and - again - beautifully done. So, yes, crashes. 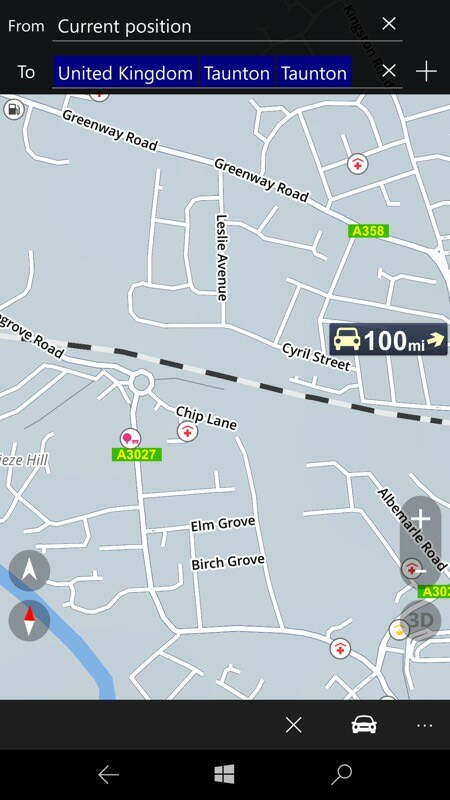 It's understandable that Sygic needs a lot of RAM, what with the maps, planning, traffic and UI. And Sygic certainly seems to run better the more RAM your phone has. But it's still unstable. When you crank Sygic up, there's a 10% chance that it'll crash back to the Start screen within 30 seconds. Curiously, if it doesn't (so 90% of start ups) then it'll be rock solid from then on, for hours. The '!' 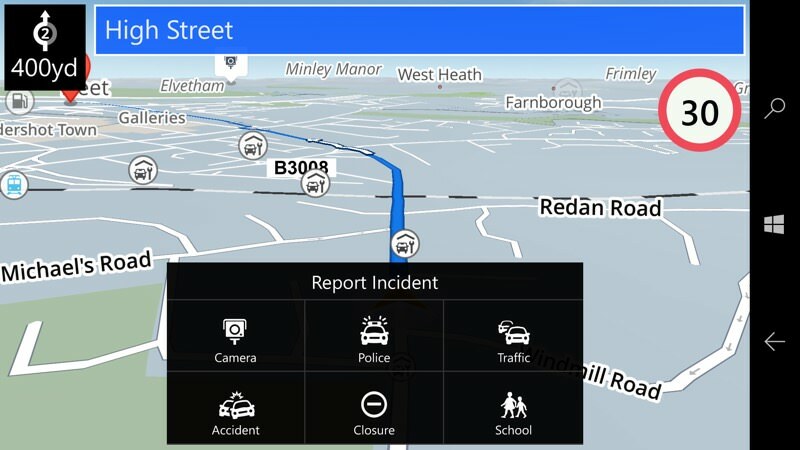 control, bottom left in the main UI, is for reporting a problem on the roads. It pops up this mini menu, just big enough that you can hit it safely while driving, in order to help other drivers. And then there are the pauses. Also probably RAM-related, every now and then Sygic will just stop, with unresponsive UI, for many seconds... and then suddenly carry on as if nothing had happened. Very frustrating if you're trying to interact with it under time pressure to get somewhere. 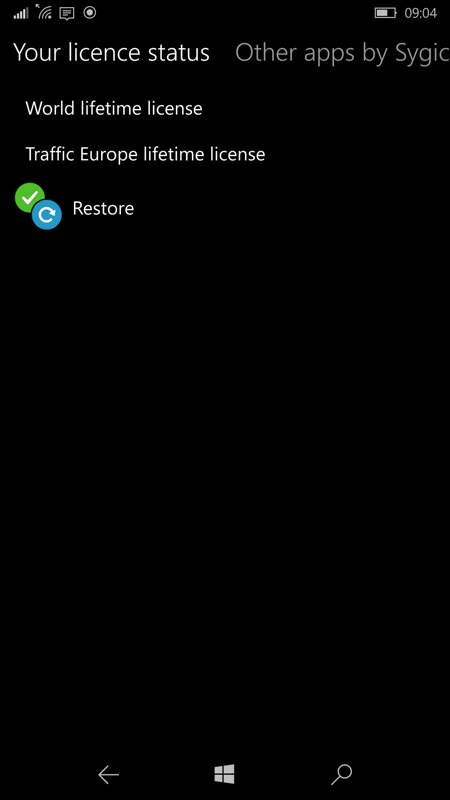 Both the crashes and pauses are to do with the way Sygic uses RAM under Windows 10 Mobile, I suspect, and also because it hasn't been updated for years. I suspect it would behave far better if re-compiled under a more modern Windows 10 SDK. Heading out to Basildon Park, I'm cycling here through three different routes offered - each is shown clearly and with estimates of duration in current traffic - just hit 'Go' on the one you want, etc. (right) Ah yes, out of date maps. See that little roundabout in the middle? 'Chip lane' is now 'Trenchard Way' and is a major by pass through to the East of Taunton. Yet it's nowhere on these old maps. You'll remember that one of the reasons I was looking at Sygic was because Windows 10's maps were out of date? Sygic uses TomTom's maps and I thought it should therefore be bang up to date, but in practice the maps downloaded at installation time are very old (2016 era?) and it's again clear that (as with Microsoft's Windows 10 Maps) lack of TLC (Tender Love and Care) has meant that the files have fallen out of step with TomTom's latest data sets. Which is crushingly disappointing for a commercial product that's still being sold at premium license prices. Are old maps really that big an issue? Maybe, maybe not, depending on where you live. On one of my regular routes, through Taunton, a new road cuts ten minutes off my travel time in rush hour, yet the road is nowhere to be seen here. Ten minutes isn't the end of the world, but I can think of another example where a road into Taunton was cut off last year and re-routed, and this will lead you in Sygic into a dead end. So, yes, up to date maps are very important indeed. Although Sygic's licensing system has been simplified since I first looked at it in 2015, it's still a two tier system. And one which I don't understand, since surely everyone's going to want 'traffic' too? A disclaimer: although I'm shown here with lifetime licenses, they were provided free of charge by Sygic for this review. The licenses are tied to your Sygic account, i.e. your email address and password, so can easily be restored later if needed. Premium? Yes, money is another possible issue. 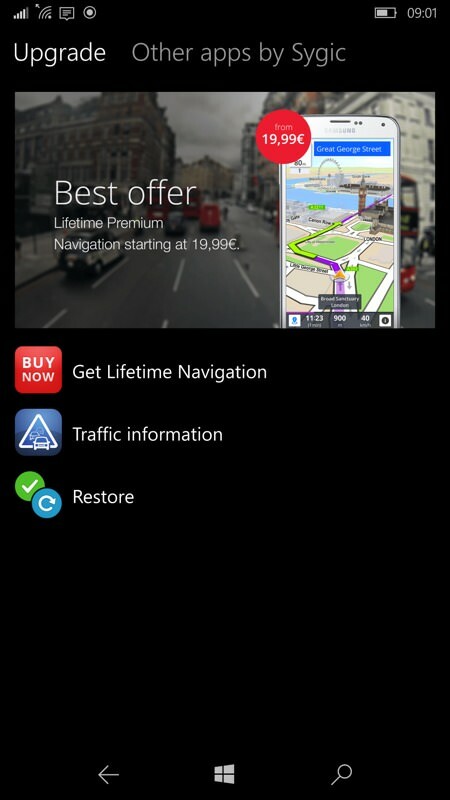 Sygic comes with a trial period, which is great, though it's worth noting that the main app and traffic functionality have to be paid for separately and that both are over £10 for a lifetime license, i.e. each. Now, if Sygic was rock solid and up to date then I'd have no hesitation in recommending it, even at a joint price of over £20 (exact amounts vary by region and according to special offers), but I'm loathe to do so until the maps have been sorted out. At this stage in both Sygic's and Windows 10 Mobile's life cycles, it's unlikely that anything will be done to sort all my complaints out, so don't hold your breath. In the meantime, comments welcome if you've tried Sygic -how did it do in your area and on which device?